Ubisoft has just shared its financial results for Q1 2018, and it’s a new record for the company driven largely by sales of DLC and digital items. This quarter also sees PC becoming taking the #2 spot among the company’s reported platform standings, sitting somewhat ahead of the Xbox One in total sales – though still well behind PlayStation 4. As with most companies, Ubisoft’s financial years are a bit off the calendar, so first quarter here means the three months ending on June 30. 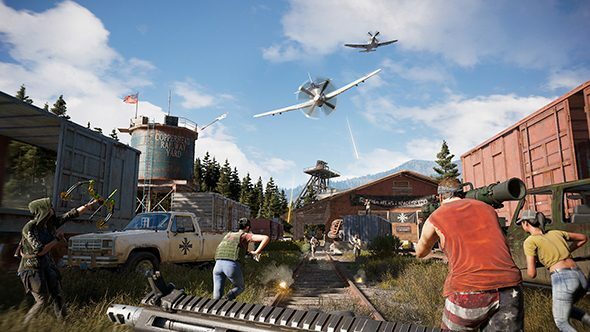 In terms of big releases, that means sales from Far Cry 5 – aside from the sizable first four days – and the launch of The Crew 2. Take aim at the best FPS games on PC. Ubisoft attributes its record quarter to back-catalogue games and player recurring investment – or, rather, DLC and microtransactions. PRI is up 51.5% for the quarter, as part of an overall digital net booking increase of 76.7%, translating in money terms to €287 million. Back-catalogue net bookings were up 74.7% to €332.6 million. Overall net bookings were up 88.8% to €381.5 million, beating the company’s €350 million target for the quarter. To translate that into more palatable terms – games as a service are doing well. Even without a whole lot of big releases for the quarter, Ubisoft has titles like Rainbow Six Siege to hang its hat on, not to mention excellent DLC for games like Assassin’s Creed Origins. But, of course, the report doesn’t break down exactly which titles make the biggest contribution. PlayStation 4 was the top platform for the quarter, representing a 38% share of Ubisoft’s net books. PC sits in second place with 24%, ahead of Xbox One at 22%. It’s impressive to see PC overtake one of the consoles, but it’s not a first – the computer platform took a slight lead over Xbox One in Q1 2016, as well. But Ubisoft cited big growth on PC in its 2017 sales figures, and the company’s likely to continue pushing to take advantage of this market.